A Promise of Stardust really surprised me and I have no idea why. Possibly because I didn’t know much about it before picking it up and it blew me away. Or maybe because I was desperate to read at least four other novels in my to-be-read pile but had to read this one first. But regardless of the reason, I was pleasantly surprised and thrilled that I happened to get a chance to read this one. A Promise of Stardust is at once heartbreaking and tender, explosive and thought provoking. The drama and devastation unfolds immediately from the first page and from there, both a love story and an ethical dilemma unfold. I was heartbroken by the story and moved to tears. You will probably find yourself on one side of the issue or the other and maybe even tottering on the fine line in between. Sibley handles the subject skilfully and with such grace, dignity and sensitivity. The relationship between Matt and Elle is gradually revealed and woven through the story via flashbacks and I thought this suited the novel well. Narrated by Matt, we see his view of their relationship and the situation and I found this a refreshing change as I read so many novels from women’s perspectives. I loved that their relationship isn’t perfect and how it felt so real. It’s gritty and messy and complicated - as most relationships are. I also loved that both their relationship and Elle herself weren’t glorified and that she wasn’t portrayed as a saint in light of the accident. There was one thing that I did find a bit aggravating from time to time and that was some repetition that occurred throughout. I’ve been able to forgive it slightly as I’m sure it is something that occurs in extreme situations and is probably realistic with how life actually is at times. But it did grate somewhat, particularly the nature of the statement. I got it already, I thought, and didn’t love that it was harped on so much. 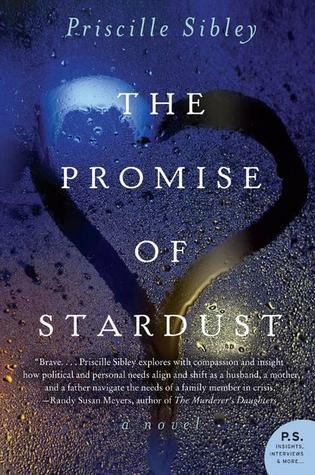 The Promise of Stardust makes you think. It will have you desperate to hug your loved ones and not take them for granted. You’ll want to get your affairs in order and have conversations. This is a fabulous read for anyone looking for something a bit deeper than the standard chick lit fare. Although I don’t read much of either, all I could think while reading was that this novel seemed a perfect blend of Jodi Picoult and Nicholas Sparks and I believe fans of either will enjoy this one.